Mr. Deeds Goes to Town (1936) is another lighthearted classic Frank Capra screwball romantic-comedy regarding the broader philosophical themes of individual innocence and big-city corruption, and the power of a small-town hero/common man as a citizen in a democracy. The small-town yokel is determined to give his money away in a redistribution plan, to help other people (mostly poor farmers) achieve economic self-sufficiency. The "share-the-wealth" philosophy was certainly gratifying to Depression-Era audiences. The simple plot is a comedy about an innocent, common-sense populist (and tuba player), Longfellow Deeds from Mandrake Falls, Vermont - a newly-made multimillionaire with $20 million, who immediately encounters conflict in the foreign, alien and heartless environment of the city and struggles to maintain his integrity against lunacy, the establishment, and those who try to prevent him from giving away his wealth. A "Cinderella" romance subplot involves a deceitful, hard-edged, and sardonic female newspaper reporter who falls in love with the newly-rich, guileless fortune inheritor while getting an "inside story" and making fun of him in her newspaper. The film received five major Academy Award nominations, including Best Picture, Best Actor (Gary Cooper with his first Oscar nomination), Best Screenplay (Robert Riskin), Best Sound Recording, and Best Director (Frank Capra). Producer/director Capra won his second Oscar as Director for this film, following his initial victory for It Happened One Night (1934) - ultimately he would win three Academy Awards for direction. The film helped make co-star Jean Arthur a prominent leading lady for the rest of the decade and into the 40s - it was the first of her three films for Capra. She was brought in to star in the film when first-choice actress Carole Lombard opted to make My Man Godfrey (1936) instead. An irreverent modern remake titled Mr. 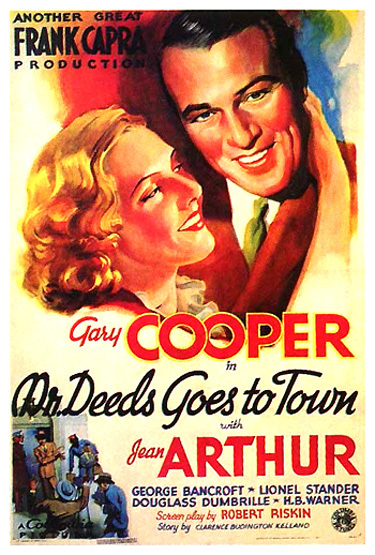 Deeds (2002) starred Adam Sandler in the Gary Cooper role as a New Hampshire pizza parlor owner who inherited $40 billion, and Winona Ryder in Jean Arthur's role as a newspaper reporter. In the film's opening, a car speeds into a dangerous curve and plunges headlong through a protective fence and down an embankment, killing its occupant Martin W. Semple, a New York financier. News headlines broadcast an inheritance of $20 million to be paid to the multimillionaire uncle's distant nephew. CIVIC LEADER KILLED IN AUTO ACCIDENT! SEMPLE HEIR AS YET UNKNOWN! Three of the main characters from the big city are introduced in the next scene. A cynical news editor MacWade (George Bancroft) wants the inside scoop for stories published each day in the New York Mail. He shouts into a telephone, demanding to know the identity of the Semple heir: "If the Semple attorneys don't know who the heir is, who does?...Who's getting the Semple dough?" On the other end of the phone is cigar-smoking, press agent/publicist Cornelius Cobb (Lionel Stander) who denies knowing anything. Slick New York lawyer John Cedar (Douglass Dumbrille) insists that they hang up, but Cobb knows that the story will be great press: "Somewhere in this country a guy is walking into twenty-million bucks." According to Cedar, Cobb's job is to keep the "newspapers away from him." Cedar: Do you know a fellow by the name of Longfellow Deeds? Stationmaster: Deeds. Fine fellow, very democratic. You won't have no trouble at all. Talks to anybody. Mrs. Meredith: He's over to the park arranging a bazaar so as to make money for the fire engines. Mal, you should have known he was at the park. Stationmaster: Knew it all the time, but these men said they wanted to see the house. Can't read their minds if they don't say what they want. She offers small-town hospitality: "Sure I couldn't get you a glass of lemonade or something?" Expositionally, she explains background about Deeds: he co-owns and runs the small-town tallow works. The unassuming man makes most of his income by writing poetry and sentimental, homespun rhymes for birthday cards and other holiday cards: "Longfellow's famous. He writes all those things on post-cards, you know, for Easter and Christmas, and birthdays." [His name is meaningfully descriptive: the poet is named after another poet, Henry Wadsworth Longfellow, and his last name signifies his importance that is derived from his actions and deeds.] Deeds' pet English setter dog anticipates the arrival of his owner by jumping up on the inside of the front door with his paws. Budington must feel like an awful stranger. And now poor Cobb is out of a job. Deeds: Do you know how much twenty million is? Mrs. Meredith: I don't care how much it is. You sit right there and eat your lunch. You haven't touched a thing! While the city people worry that Deeds ("The Pride of Mandrake Falls") won't appear at the train station, he is found in the midst of the mob-crowd and his community of folks as the sole tuba-player in the band for his farewell, playing "For He's a Jolly Good Fellow." A little boy who clings to Deeds' back as he approaches the train, still playing his tuba, must be removed. As the train pulls away and the band plays "Auld Lang Syne" for his send-off, he stands playing his tuba on the rear observation platform of the train, calls out two specific names ("Goodbye, Mrs. Meredith, Goodbye Jim"), and gulps: "Gosh, I got a lotta friends." [Mandrake Falls, his town, symbolizes fertility - a mandrake root is a sexual aphrodisiac. His transplantation to New York is in sharp contrast - a place of deadness and gray sunless days.] During the ride, Cedar is determined that his law firm manage Deeds' estate and is intent on offering management of the fortune: "Leave everything to me." As the train approaches the outskirts of New York City, it ominously descends into a dark tunnel. Before Deeds is shown in his new New York home, there are three short scenes to identify additional plot circumstances and characters. In a long tracking shot, the camera follows behind slick lawyer Cedar's entrance into the offices of his law firm, where he assures his colleagues: "We have nothing to worry about. He's as naive as a child." Budington (Arthur Hoyt) worries that the firm hasn't officially been granted Deeds' power of attorney. Cedar announces Deeds' intentions with the money: "He guessed he'd give it away" - and is promptly labeled a "nit-wit." The lawyers must cover up their mis-use of Semple funds. The dead man's crooked lawyer wants to have jurisdiction over Deeds' money before the books are audited: "Those books will never leave this office." He is determined to handle the nephew's finances and cover up past skimming from the estate. In another short scene, Deeds' cousin Mr. Semple (Jameson Thomas) and his annoying, grasping wife (Mayo Methot) are seen considering contesting the uncle's will and making themselves candidates for the inheritance: "Ten years we've been waiting for that old man to kick off and then we were gonna be on Easy Street." Semple complains back: "Can I help it if my uncle didn't like me?...Shut up! It's too late now and you're a nuisance." In a third scene, within the New York Mail newspaper office, news editor MacWade has assembled reporters and photographers to criticize them (calling them "imbecilic stoops") for not having a front-page story and angle - after three days - on the newly-rich Semple heir in town (the "corn-fed bohunk"): "What does he think about? How does it feel to be a millionaire? Is he gonna get married? What does he think of New York?" They have all been hindered by Cobb, who has kept Deeds "under lock and key." In the background of the all-male group, MacWade's crack ace newspaperwoman-reporter, pretty blonde, Louise "Babe" Bennett (Jean Arthur) in a tailored gray suit, is bored but at ease while leaning on a table next to an office glass partition. She is engaged in a meaningless, whimsical, child's rope trick, and eventually succeeds in jerking and shaking it into a knot with one hand. She hasn't brought in the story either: "I thought I could depend on you, but you're getting as bad as the rest of 'em." Babe doesn't care about getting the story until MacWade promises her a month's paid vacation if she circumvents Cobb. With pay? Leave four columns open on the front page tomorrow. Immediately, Deeds is assailed in the bedroom of his newly-inherited, stony and colorless mansion by servants, butlers, creditors and others who are interested in his money. He is surrounded, actually entrapped by a tailor (Franklin Pangborn) and outfitters measuring, pinning, and refashioning him for new clothes. Cedar warns him of continual public scrutiny and unwanted notoriety by the press, and is present to again officially seek Deeds' power of attorney: "It'll save you a lot of petty annoyances." Deeds has already noticed the annoyances: "The strangest kind of people - salesmen, politicians, moochers, all want something. I haven't had a minute to myself. Haven't seen Grant's Tomb yet." But Deeds cannot understand why Cedar, and other lawyers, are willing to act as both investment analysts and legal advisors for no fee: "Puzzles me why these people all want to work for nothing. It isn't natural." Hallor (Charles Lane), a representative for Mrs. Semple, the late uncle's alleged common-law wife, presents a "legal claim" for consideration, but Cedar cautions Deeds about conceding to him: "He's capable of causing you a lot of trouble." Deeds worries Cedar further when he asserts: "If she was his wife, she should have all the money. That's only fair. I don't want a penny of it." However, Deeds is interrupted when summoned downstairs to the mansion's library to meet with the opera board, and to serve in the place of his uncle who was the chairman of the board. They always hold their meetings in the mansion because, as Cobb astutely points out: "Why do mice go where there's cheese?" The board's spokesman is Douglas (Edwin Maxwell) and to Deeds' surprise, he has been elected to preside as the director, or chairman of the opera house. During the treasurer's report, the financially-strapped members of the opera expect him to pay the opera's annual deficit of $180,000. According to Douglas, the opera is "not conducted for profit" but is an "artistic institution." But Deeds then assumes that they must be off-track and not operating as a business: "We must give the wrong kind of shows." He quickly confronts them with their snobbishness and refuses to 'naturally' help subsidize their annual deficit: "Excuse me, gentlemen, there's nothing natural about that." In the middle of the meeting, he runs to the window at the sound of fire engines' sirens, exclaiming: "Gee, that was a pip!" He demands that they make the opera pay or close it down: "If it's losing that much money, there must be something wrong. Maybe, maybe you charge too much. Maybe you're selling bad merchandise. Maybe a lot of things."